To be truly successful in life, you must be willing to take risks. Risk-taking can be accurately defined as trying something new or difficult. Don’t take risks just to try something new. You must consider the rewards or benefits of taking risks before doing so. Taking risks can result in achieving goals or growing as a person and martial artist. Think about the difference between a “positive” risk and a “negative” risk. For example, skipping a family event to be with your friends is not a positive risk because your family members will know that you weren’t with them. There is no reward or benefit for such a risk. When you have good character you will understand good versus bad risks. Practice in front of your friends and then go for it? Lie and say that you have other plans that night? Skip the invitation because you’ve never given a speech? Refuse to join your friends because you are not comfortable swimming in deep water? Lie and tell your friends that your arm hurts? Jump into the deep water and hope that you don’t drown? Water-ski once you have the proper instructions? Lie and tell your friends that you have an injury? Don’t water-ski because you are afraid of the water? safety. Make sure that you understand each and every situation before you make a decision. Test your courage by trying new activities, if you can do them safely. Remember, taking good risks can lead to many new opportunities and experiences in your life. Observation and awareness require conscious effort on your part. Eventually, they will become instinctive and valuable skills. Know where the exits are when you enter a movie theater or other public place. Be aware of your surroundings when you are walking on an unfamiliar street. Be relaxed, but always ready to protect yourself. BillFitzPatrick is a 5th-degree Black Belt, holds a Master’s Degree in Education and runs the non-profit American Success Institute at: www.mastersuccess.com. Karen Allen is the student of the month for January 2013. Karen Joined the school in June of 2012 after watching her son Cody Allen having so much fun and learning valuable life skills. Dedication and excellent attendance are only a few words that describe Karen’s commitment to training. 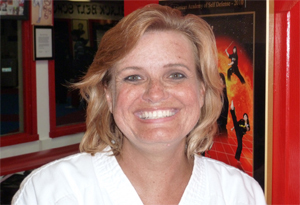 As a student , wife , and Mom Karen still finds time to train and make Martial Arts training an intricate part of her life. Sifu Rick wishes to salute not only Karen but her Family as well, especially husband Bill for all their support. The only fool bigger than the person who knows it all is the person who argues with him!! Adult Belt test Saturday, February 9 during Class. LEADERSHIP CLASS Saturday 1/5/13 8:00am. Saturday 1/19/13 Annual Boot camp class 11:00am till 11:30am. I started my martial arts training when I was 12 years old. At that time, I was not very confident. Ever since I started classes, I have worked hard to become the best person I can be. I have better self-control and concentration during school, which helps me to earn better grades. When kids from my school do drugs and drink alcohol, I know better than to go with them. Martial arts has helped me in my life so much. We learn such great lessons. Now that I have been in martial arts for almost four years, I am able to avoid bad situations, control myself and not talk out of turn at school. I can even teach other students during class, which really helps my confidence. I love martial arts! Danielle Fulton trains at Nevin Baskin’s Mountain Valley Martial Arts in Church Hill Mall, Pennsylvania. Fructose is often described as a “real” sugar and, therefore, much more beneficial to your body than glucose or “regular sugar.” Table sugar (sucrose) is process by your body to become glucose, as are many other more complex sugars and carbohydrates. Is fructose better for your body than other sugars? I always thought that fructose was better for you, based on the lesser effect it has on insulin/blood sugar. (That is why fruit sugar is acceptable to people with impaired insulin response.) I’ve also always been a big fan of whole foods, so I’ve always preferred foods with natural sugar. This is true, but the incredible amount of high-fructose corn syrup that are found in many foods is causing researchers to scrutinize fructose more closely. New research may link fructose to the current increased rates of obesity. The research doesn’t say that eating fruit leads to obesity. Rather, high-fructose corn syrup is the culprit. In recent years, the average American’s consumption of added sugars has increased to almost 2.5 times the recommended daily limit. Almost half of that increase comes from high-fructose corn syrup. Most of this intake is in the form of sweetened beverages. You may ask, “Why is fructose a problem when it is supposed to be “better” than “regular” sugar. Recent research suggests that the problem might be related to fructose’s effect on ghrelin, a body chemical which is associated with increased hunger. Glucose and mixed-carbohydrate meals suppress ghrelin, which may account for the short-term satiating effect of carbohydrates, whereas fructose suppresses hunger to a much lesser degree. Fructose ingestion also favors lipogenesis (creation of fat stores). In addition, fructose cannot enter brain cells as glucose can, so your body still needs to take in glucose to fuel your brain. Beverages sweetened with high-fructose corn syrup could be making you eat more because they aren’t making you feel full! Furthermore, they are loaded with empty calories and the additional calories are probably becoming fat. Your “take home lesson is: Avoid presweetened beverages. Instead, drink water or other unsweetened beverages. My personal favorite is fresh brewed tea!